If you had the power and the position to change anything at work or in your neighborhood, what would you change? This is the end of the series, Cross Scene Investigation. We started off by looking at the evidence for the resurrection of the Christ, we said Because He lives, I can face tomorrow. Then we looked at the first character, Barabbas, the man who missed the cross and reminded us that Jesus became a substitution sacrifice for each one of us. We do not have to pay for sin. We can accept him and enjoy the blessing of freedom. We said Because He died, I can choose to live in freedom. Thirdly we looked at Mary, the wounded follower. As we go through suffering, we are reminded that Because He endured the cross, he understands and cares when I endure mine. Last week, we looked at Peter, the man who denied Jesus. We looked at the limitation of compromise. We said that Because of the cross, I have a second chance. Today we look at our last character. We were born to make a difference. 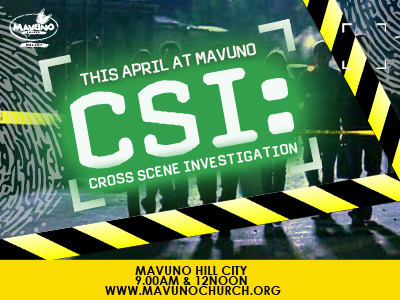 This is what Mavuno’s mission is all about: Turning Ordinary People into Fearless influencers of society. This week ordinary people from all over the world have been asking what they can do to make a difference in Nepal after the devastating earthquake. We saw many Kenyans donate blood, give material things and hold vigils for the 147 departed during the Garissa attack.We all want to make a difference: help, encourage and influence positively. Over the years, great initiatives from Mavuno have affected lives. A few examples include: Mizizi behind bars, Mizizi at work, Filamu Juani, etc. I have always been concerned about the state of our nation and continent. That is why in 2002 I plunged into politics in a bid to experience what happens in that field and see what I can do to change. It was a fearful adventure, but I learned a lot and have been able to relate with and influence young politicians as a result. Then the infamous post-election violence happened. I felt I had to do something. Pastor Oscar led a team of us to go around the nation in an initiative called Msafara: Wheels of Hope. I was glad, alongside others, to facilitate prayer and reconciliation for the nation. Soon thereafter, I felt I needed to start an initiative to contribute to the transformation of the nation. Transform Kenya was born. Now it is Transform Nations, with programs in Kenya, Uganda, Tanzania, and Rwanda. We have done some training in other African nations and out of Africa in Haiti and Jamaica as well. I have used the little influence God has given me to mobilize for prayer for Kenya, train now more than 5,000 men who have graduated from ‘Man Enough’, see more than 5000 boys prepared to be real men and see many leaders in the corporate world and mothers of sons equipped. We are about to launch a ‘Boys to Men’ campaign, where in partnership with others, we will see 1 million boys mentored by older men in the next 3 years. That may sound grand but there are many others doing great things to touch our workplaces, change the media and affect the different sectors of society. There is a God-given desire in each one of us to do something significant. For some it will be in a large scale, for the majority of us it will be in a ‘smaller scale’ (but nothing is small about the transformation of an individual). Lots of us wait for a huge opportunity or title to make a difference. But God has already given each one of us a position from which we can influence. Daily, we miss opportunities to become fearless influencers. Everyone has some dream, desire and divine dissatisfaction to do something that touches the lives of others and make this world a better place. What can I do? In fact, the question for many usually is this, ‘where do I start? Today we learn some lessons from a character around the cross on how to recognize opportunities for influence and significance around us. Pontius Pilate was the Roman governor, or procurator, over Judea. Tiberius was the Caesar, the Imperial Emperor of the Roman Empire, ruling from the headquarters in Rome. Pilate was the Emperor’s regional representative. We are told these two gentlemen did not like each other very much. In history, Pilate was an anti-Semitic Gentile, Roman to the core. ‘An absolute wolf for Jewish blood.’ He did not need to please the Jews. He was a man of decision, a hardened and cruel soldier, not a novice by any chance. During the Jesus’ incidence, Pilate was “on report” or under investigation from Rome. He was under surveillance so he had to be in best behavior during this Passover. He needed to be cautious. Handled badly, this could be his last visit to Jerusalem from the coast of Caesarea for the celebrations. In fact, history says that eventually Caligula banished the man to Gaul, a distant region, far to the northwest of Italy, beyond the Alps. There, he suffered an emotional/mental breakdown, and, ultimately he committed suicide. After the religious interrogation, Jesus was brought to Pilate to be questioned. Pilate had heard a lot of Jesus. He longed for this day to question Jesus. “I am the King of Jews” – That must have worried Pilate. He is in a sense challenging Caesar’s kingship. But then, his kingship is different. “What is the truth?” Pilate asked. This is the question of the ages. Jesus had answered that question through his teaching. Not Guilty verdict (verse 38) – Pilate declared Jesus innocent. Pilate unawares fulfilled scripture. He had Jesus flogged to please the Jews. Had him dressed up as king – crown of thorns, a purple robe and praise. It was mockery, but was also a way of trying to let himself off the hook. On realizing that Jesus was a Galilean, Pilate sent Jesus to Herod for questioning. (Luke 23:5-7). In predictable political fashion, Pilate refuses to make the tough call and passed on the buck to Herod Antipas, the tetrarch over Galilee. Hard luck! Jesus came back to Pilate. When you read Matthew 27:15-26, you note that Pilate’s wife was like his conscience. She had a dream and she shared with him as he sat on the judgment seat – not to have anything with the innocent man. He was warned. He washed his hands but still did not use his influence to do the right thing – release an innocent man. Pilate refused to influence. The cross happened and a way was made for me to be a light in a dark world. The main point is this: Because of the cross, I can be a fearless influencer. The Scandal: Pilate declares Jesus innocent in a court of law but still proceeds to hand him over for crucifixion. A would-be fearless influencer compromises justice and misses an opportunity to make a difference. He almost sets him free, but he did not. He could not make up his mind. But for you and me, Because of the cross, I can be a fearless influencer. This man of power and influence showed weakness of conscience and character! He had a position, a title and a chance to do something significant. Indecisiveness – He heard the witnesses, examined them, reached a verdict but still could not make the decision. Have you ever missed an opportunity to influence because of procrastination or hesitation? Ever had to say, ‘I wish I had …?’ Just do it! People-pressure – People can pressure you into doing something to please them or to get them off your back. People kept shouting to pressurize him to execute Jesus. He gave in. Have you missed a chance to influence because of the crowd – desire to please them? There is always pressure to hang out with the chicken (stick with the ordinary people) and not soar with the eagles. Do not listen to the crowds! There are many times we miss an opportunity to influence at work and all around us because of fear, pressure from people (friend and foe) and lack of backbone to make a decision. To influence, you must bring these three to the cross. Because of the cross, I can be a fearless influencer. But what is fearless influence? It is bringing the kingdom – the influence of King Jesus into the spaces where God has placed you. It is fighting against the things that diminish the kingdom at work: corruption, oppression, lies, sexual perversion, and disrespect for authority. We need to pray and act to bring God’s kingdom in our places of work, in our families, on the roads and wherever you may be. The basic currency for the kingdom is truth. Truth has been under assault in our generation. God’s truth on marriage, relationships, business, diversity and really all of life has been challenged. In the different sectors of society – Media and Arts, Family and Education, Church and Missions, Economy and Business, Governance and Politics, Health and Environment – truth is needed to counter the lies. You have been placed in one of those sectors to make a difference. You cannot wash your hands and sidestep your responsibility like Pilate. What has held you back from being a fearless influencer? At work, with friends, in your relationships, at home, in the community and wherever you go? What must you overcome to represent the one who died for you, to bring down his kingdom down and to establish truth in your life and environment? What would happen if everyone, everyday of the week, at home and at work, on the roads and in the office, saw themselves as representatives or ambassadors of the kingdom? That we saw our calling as standing and advocating for the interests of King Jesus? Bringing in heavenly values into our business, relationships, workplaces, education, the media and health? Corruption would reduce, relationships would be less painful, the streets less chaotic and wicked, poverty much less, the quality of life better. Many more would see the light, and Jesus; our King would smile more often. This entry was posted on May 3, 2015 at 2:05 pm and is filed under Mavuno Sermons with tags Because of the cross I can be a fearless influencer, CSI, John 18: 28-40; 19:1-16, pastor simon mbevi, Pilate. You can follow any responses to this entry through the RSS 2.0 feed. Both comments and pings are currently closed.